India is celebrating “80 years of Test cricket”. The country played its first ever Test match in the Lord’s cricket ground in London against England in the summer of 1932 and has since then become a name to reckon with in cricket-playing countries. Although India lost the Test by 158 runs there were some sterling performances that were acknowledged even by Wisden, the almanac that is reckoned as the “Bible of Cricket”. Playing against the likes of Herbert Sutcliff, Eddie Paynter, Wally Hammond and Douglas Jardine, all big names in international Cricket, the Indians were not quite overawed; in fact they did not do too badly in their first official outing. Even Wisden appreciated the performances of two speedsters Amar Singh and Mohammed Nissar, the agility in the field of Lall Singh who, later in the second innings in partnership with Amar Singh, indulged in some lusty hitting making 74 runs in just 40 minutes. The Indian team would probably have fared better had some of its players, especially the side’s best batsman and officiating skipper, Col. CK Naidu, not been suffering from injuries. “Tests” are cricket matches between two national teams and came to be known as such as they were of gruelling character that tested the relative strengths of the two sides. They are also the longest form of cricket matches between representative national cricket teams with “Test status”, which is accorded by the International Cricket Council (ICC). 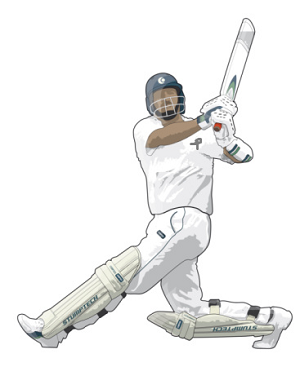 Reckoned ultimate in testing a side’s ability, skills of its members and, of course, their endurance, playing a test match even now is an ambition nursed by numerous cricketers despite the growing popularity of lucrative shorter varieties of cricket matches. Tests are now regulated to be played over a period of five days – each side playing two innings. Not many probably are aware that earlier Tests used to be “timeless”, i.e. they were played till completion of both innings regardless of the number of days taken in doing so. The country had to wait for around six years to play its first official Test after having been invited into the Imperial Cricket Council (ICC’s former avatar) in 1926. Starting as a “minnow” in 1932 – like what Zimbabwe is today – India has developed over the years into a strong cricketing nation. Playing at home and abroad, it has registered wins practically against every other cricket playing country even on foreign soil. In the “Wisden on India”, an anthology brought out in 2011 charting Indian cricket, Jonathan Rice, a respected cricket writer said in his Introduction that by winning the 2011 World Cup India became “the only nation to have won world cricket titles in the 60-over, 50-over and 20-over formats. They are currently ranked as the number one Test nation”. Cricket was brought to the country by the Englishmen in early 1700s. The first match was, reportedly, played in 1721 between two teams that were made only of Englishmen. Not until 1877 the Englishmen invited the Parsees, who had formed their own club in 1848, to play against them. Later, in the earlier years of the 20th Century teams were formed community-wise and thus Hindus, Muslims, Sikhs and Parsees used to play Quadrangular tournaments every year with the Europeans. In 1937 a fifth team called “The Rest” including Christians, Jews, Buddhists and Singhalese was allowed into the tournament making it Pentangular. However, to discourage communal divisiveness in the game the pentangular tournaments were discontinued in 1946. By this time, however, Ranji Trophy competitions, instituted in 1934 in the name of Ranjit Singh, Jam Saheb of Nawanagar who used to play for England, had taken off in which teams constituted on geographical basis took part. The competition has been carried forward and is now played among the teams of various states. It is a tournament vital for throwing up players for selection in the national team. During the early years cricket was played only in small pockets in the country. Big cities like Bombay and Calcutta, Delhi and Lahore (now in Pakistan) had taken the lead. Many princes of the former Indian states like Patiala, Holkar, Baroda also patronised cricket, hence, many cricketers gravitated to some of these states seeking better opportunities to play competitive cricket. Cricket was popular also in the princely states of what were earlier Rajputana and Kathiawad. Kathiawad, in fact, produced two “Greats” – Ranjit Singh, Jam Saheb of Nawanagar and his nephew Kumar Sri Duleep Singhji. Both played for England as did another feudal, Nawab Iftikhar Ali of Pataudi. However, the first two found places in the prestigious Wisden’s Hall of Fame. Nawanagar in Kathiawad also produced another Indian great who is known the world over as Vinoo Mankad. His cricketing exploits in England and India during the post-War and early post-independence years are legendary. The British Indian government thought it unthinkable to send representative Indian teams abroad unless captained by a Maharaja regardless of his competence in the game. Thus, the Maharaja of Porbandar and Maharaj Kumar of Vizianagaram (popularly known as Vizzy) led the 1932 and 1936 Indian teams, respectively, though each of them never measured up to the standards of a test player. The Indian team’s 1946 tour of England was captained by the Nawab Iftikhar Ali Khan of Pataudi, who, however, having been pulled out of retirement, was well past his prime. Cricket in India was indeed an elitist game, to start with, patronised as it was by the British and the princes. It is an expensive game requiring several accessories as also a specially made pitch to bowl and bat on. Played generally among the urban upper middle classes, it was beyond the affordability of many – individuals, organisations or institutions. Not requiring expensive appurtenances, field hockey was, therefore, more popular and, as is well known, India won a string of gold medals in successive Olympics during those early decades of the 20th Century. Cricket’s ‘democratisation’ commenced even as the country’s political independence came within sniffing distance when Lala Amarnath, an all-rounder of repute, was appointed captain for the first tour of Australia in 1947-48. During the early post-independence years the overwhelming presence of players from regions where the game had been played for decades, especially Bombay, was significantly manifest in the national team. Slowly, over a few decades things started changing. As cricket’s popularity crept out and away from the urban centres into the hinterland – even to the badlands of North India – a distinct change progressively became apparent in the composition of the national teams. The teams, of late, have players hailing virtually from every region and from even small towns and villages displaying a more representative character. The game has become unbelievably popular in the country so much so that it is played in the open spaces in the villages with crude, improvised equipment. It is now virtually a national obsession. The Board of Control for Cricket in India (BCCI), despite its several deficiencies, was mostly responsible for spread of cricket to all parts of the country as it methodically promoted the game. The erstwhile government-owned All India Radio also massively chipped in by way of airing running commentary of test matches. In the beginning, the commentating used to be in English that, naturally, restricted its listenership. Later, however, with the introduction of Hindi commentary, coupled with the advent of transistorised cheap and portable radios, cricket reached practically every nook and cranny of the country. The 1983 World Cup victory gave its popularity a tremendous boost. With the proliferation of TV sets live visuals of a cricket match in vibrant colours are taken right into every home enabling even the uninitiated in the game to enjoy it. The shorter versions of the game, especially “Twenty-20”, the bang-bang variety, have opened up cricket for enjoyment to a vast section of spectators generally ignorant about cricket’s technicalities. The country’s vast population of cricket-obsessed fans constitutes a massive market in which cricket is sold, especially by TV channels, generating mindboggling amounts of ad revenues. In the process, the BCCI has become so rich that it has acquired unprecedented commercial clout in the cricketing world, arousing envy among the game’s former patrons. The cricketers too have gained and are paid such handsome amounts that numerous young men try and make a career of the game. The preceding eighty years of Indian cricket have been remarkable. Not only numerous players, down the years, acquired international standing, two cricket administrators even became presidents of the ICC. Some of the former players travel the world commentating on matches. The Indian Premier League – a Twenty-20 tournament – played by professionals launched by the BCCI six years ago, is much sought after as the best of foreign players offer themselves in auctions. If picked up, it is for them the quickest way to become millionaires. Although during the last couple of years the performance of the country’s team has been somewhat indifferent, yet hopefully it will soon find its former winning ways and its cricketing ability and performance will rise to greater heights before the time comes to celebrate a Century of Indian Cricket.